I enjoy exercising, so when my knee was injured I was devastated; I worried I’d have to give up my workouts. I made up my mind to find ways to stay fit without causing further damage to my knee. I found rowing to be a great option, so I started looking for a good rower in order to work out in the comfort of my apartment. 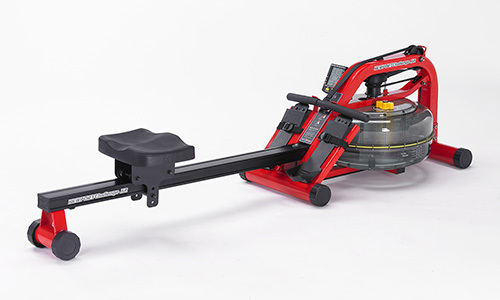 With the large number of machines available on the market, searching for a good rower that meets all your needs can sometimes be like searching for a needle in haystack. I researched a lot of machines and read many reviews. When I came across the First Degree Fitness Newport with adjustable resistance, I decided to get more information. If you’re looking for a cardiovascular session that’s stimulating and engaging, I recommend that you check out this rower. First Degree Fitness is one of the few companies that use Fluid Technology in their rowing machines. Most users seem to enjoy the lifelike rowing motion and the soothing water sound it makes during a session. Have you ever rowed on Lake Michigan on a sunny day? Well, I imagine using this machine feels something like that. This rower does have some qualities that are less than desirable for some people, but we’ll get to that later. 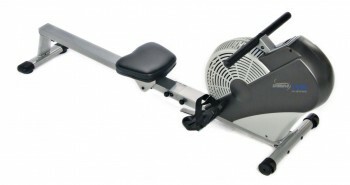 Let’s move on to the review and find out what this rower has to offer. Four adjustable levels of resistance let you easily adjust the intensity simply by flicking the valve control. This will guide water in and and out of the machine’s internal and outer tanks. To adjust the level of intensity you just need to change the water level. A fuller tank will require a lot more exertion from your end when you tug the handle. The tank can hold as much as 17 liters of water. This design feature allows you to have a high level of flexibility in the resistance that you achieve. Beginners to more advanced athletes will benefit from this versatility. The First Degree Fitness Newport also provides continuous resistance throughout each stroke without any unnecessary shaking. 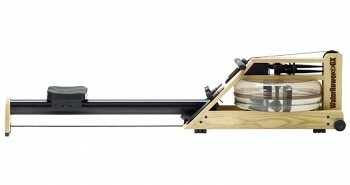 Users have commented that the machine’s rowing motion is really smooth and resembles the real thing. 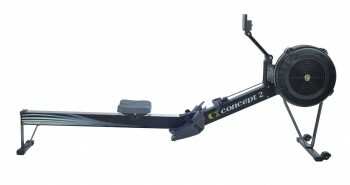 This rower gives you more resistance than what you will find on some of its competitors. The smooth motion is easy on the joints, some users say. The Newport appears to be rather straightforward and easy to assemble. 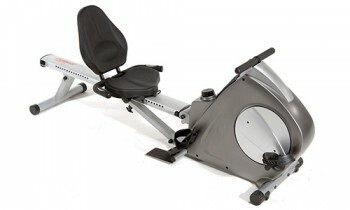 You will get all the tools that you need in the package that comes with the rower. You will also get a user manual that will provide helpful directions. Some users say it only took them around 30 minutes to put it all together. As rowers go, that assembly time is not bad at all. As a bonus, it is narrow and slim, making it easy to use in small workout spaces. It also has wheels, so moving it to store it away should be relatively hassle free. It also has an easy-tilt frame so you can fold it to stand on its base and store it vertically. The monitor is multifunctional and displays data such as time and distance rowed, strokes per minute, and calories burned per hour. All this data is easy to see and read. This nifty machine also has a USB port that lets you download performance data to your computer. You can download the software on the First Degree’s website. The First Degree Fitness Newport is a tough cookie that was built to put up with very intense workouts. 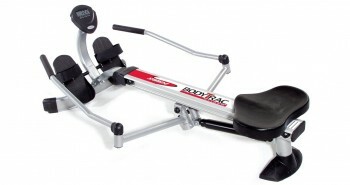 Its bright red frame is made from top-notch aluminium and this makes the rower lightweight yet very stable while in use. The seat rail is made with a high-quality anodized aluminium for added strength and durability. The tank has a tough shell that is made with polycarbonate. With proper maintenance, you should be able to keep this tank around for decades. It was clearly built to last a very long time. The manufacturers used stainless steel that is triple-bladed for strength to make the paddles. It is a quality-built machine that should last a long time. It’s no secret that some rowers are designed with uncomfortable seats. If a rower’s seat is not comfortable, you won’t be inclined to use it. The ergonomically shaped seat glides easily back and forth on ball bearings and rollers, allowing for a smooth slide without irritating unwanted noises. The handle is foam padded for an easy and comfortable grip. Although some users have reported that they dislike the bold red color, I personally think it’s vibrant and lovely. I also think that this is a very attractive rower but some people have commented that it looks a lot like a lawn mower. You’ll be able to tell from photos if you agree with that assessment. I have a hunch that it looks even better in person. You don’t get a chest strap to monitor your heart rate with the Fitness Newport, as is the case with many similarly priced rowers. That is a disappointment. Overall, I would say that the First Degree Fitness Newport is a great rower. It is solidly and durably built. It’s quiet enough to allow you to get on with other things while you work out. True rowing enthusiasts will enjoy the soothing and natural water soundtrack whooshing in the background. I also quite like the brilliant red color and I think it is a refreshing change from the gray and silver metals that you normally find on exercise machines.